Very helpful host who provided us with much useful information....many thanks Angel !! Ángel is an extraordinary host. He greeted our family warmly and sent us a long list of suggested sights and restaurants. The apartment is very clean and well-located. 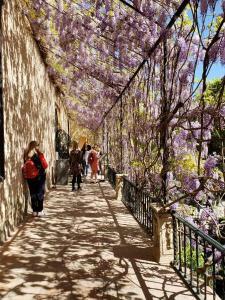 We were able to walk everywhere we wanted to see in Sevilla. The apartment is very well kept, Angel the owner takes superb care from the booking onwards. The apartment is very well taken care of. On arrival onwards he will be tipping you as where best to go, eat, taxi co ordination etc, places to to visit in Seville too, he is always there for you. If Seville is awesome, Angel is likewise. Wifi is very good and the continental breakfast is well varied and quite personalised. From the apartment to Catedral and Alcazar area approx 20minutes on foot. I recommend the apartment wholeheartedly, not to be missed. Thank you Angel. We had an amazing experience at Jardin de Santa Paula. The owner was extremely helpful and welcoming, the rooms were beautiful and clean, the hospitality was some of the best we have ever had. We will recommend this to everyone interested in visiting Seville and would love to return here if we ever visit Seville again. The place was as described and completely met our expectations. Angel, the host, was extremely helpful. The location is as central to have a quite night sleep. Very comfortable and clean just like staying in your own home, the owner Angel did a very good job to welcoming us and treating us like their friend, he even drop by early in the morning and help us to prepare our breakfast because he knew that we are in the rush! And he even prepared a lunch box for each of us! Then we came home with a surprise that he actually prepared a Spanish dinner for us, this is really so warm after a long day trip! Angel the best owner I never met before! Again, Thank you Angel so much for everything! We definitely will come back just for you! Lovely apartment for 3 adults and a baby. Very comfortable. Nice courtyard garden. Everything you need facilities wise. Very attentive host, caring at any time about his guests and providing a lot of useful information. The host is very heart-warmed and detail-orientated, always thinking for guests. I received many useful tips and recommendations before and after my staying. I was feeling like at home during my stay in this lovely apartment. Highly recommended!! 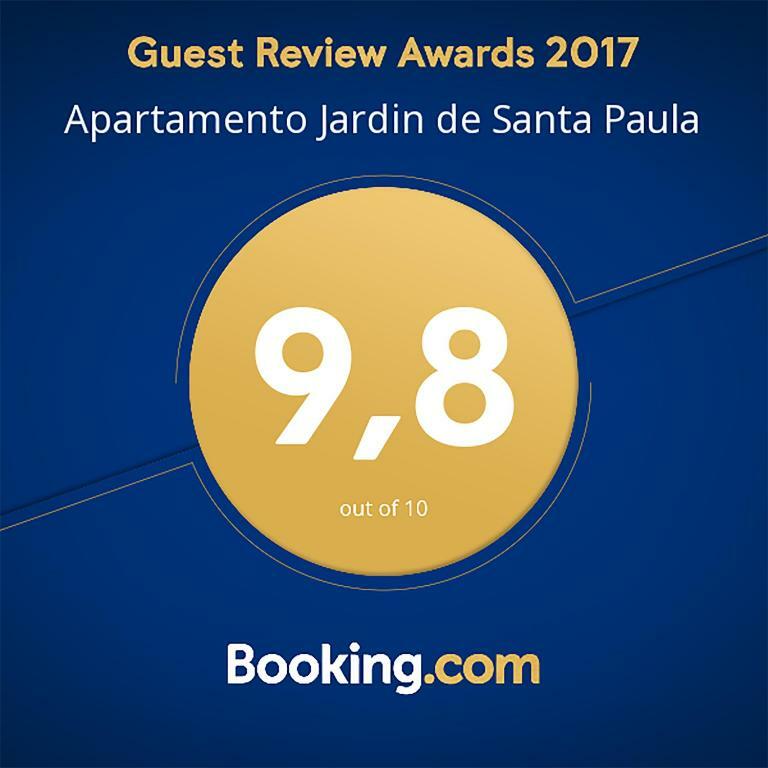 Lock in a great price for Apartamento Jardin de Santa Paula – rated 9.8 by recent guests! Apartamento Jardin de Santa Paula This rating is a reflection of how the property compares to the industry standard when it comes to price, facilities and services available. It's based on a self-evaluation by the property. Use this rating to help choose your stay! One of our best sellers in Seville! 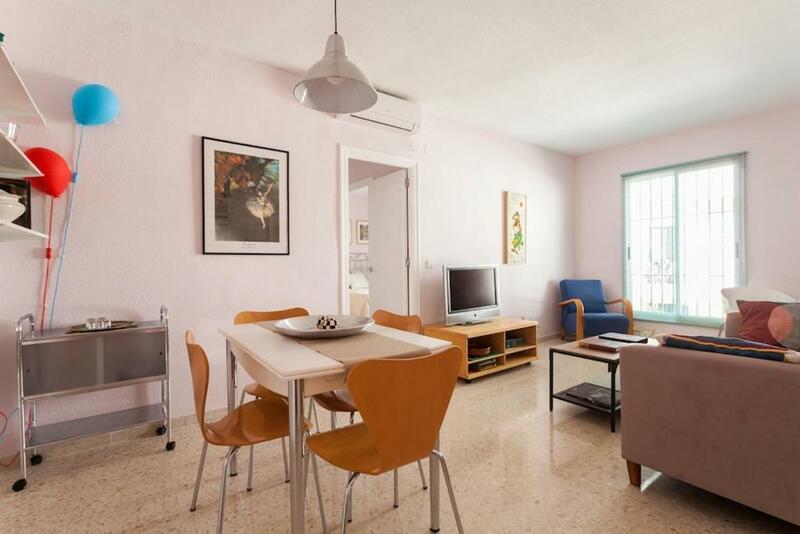 Set 0.7 mi from Plaza Nueva in Seville, this apartment features a patio. The property features views of the garden and is 0.9 mi from Archivo de Indias. It is 350 feet from Plaza de San Roman. This air conditioned Apartamento Jardin de Santa Paula has 2 double bedrooms and 1 bathroom.There is a dining area and an equipped kitchen. Towels and bed linen are offered in this apartment. The property offers free WiFi and Netflix service. Plaza de Armas is 0.9 mi from Apartamento Jardin de Santa Paula, while Triana Bridge - Isabel II Bridge is 1 mi from the property. Seville Airport is 5 mi away. When would you like to stay at Apartamento Jardin de Santa Paula? 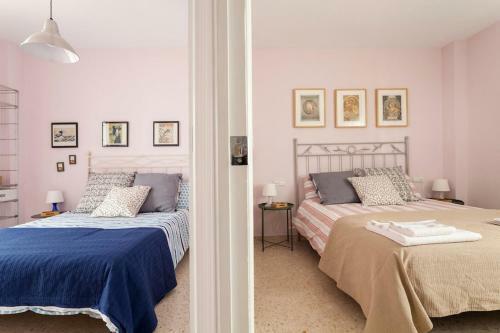 This Two-Bedroom Apartment has 2 double beds and a bathroom. It offers patio views, an equipped kitchen and dining area. 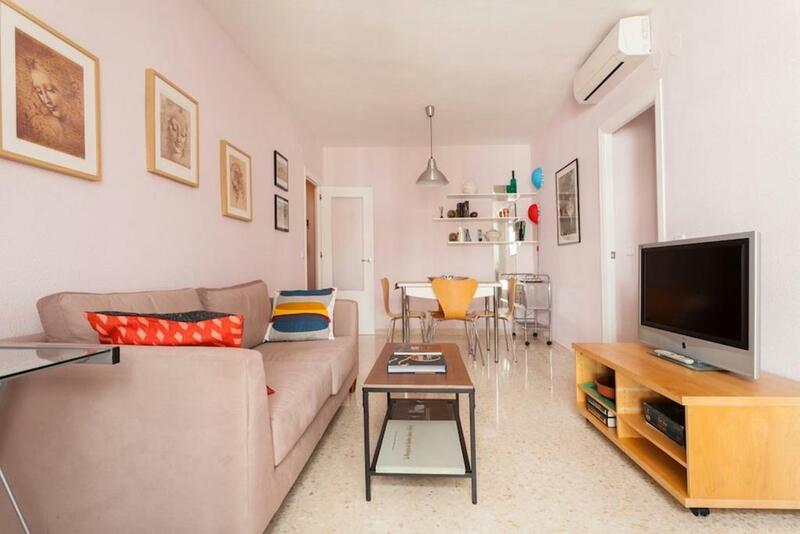 Queremos que conozcáis vuestro nuevo hogar en el Centro de Sevilla. Hasta hace unos meses, fue el de nuestra familia, donde celebrábamos todas las festividades juntos, por su magnifica y tranquila situación, ideal para vivir y disfrutar del centro de Sevilla todo el año. Ahora lo hemos renovado, manteniendo nuestro estilo, con todo lo necesario para que estéis cómodos. Esperamos con vuestra visita todas las ideas y sugerencias que tengáis, y que lo conviertan así en el hogar de TODOS en Sevilla. 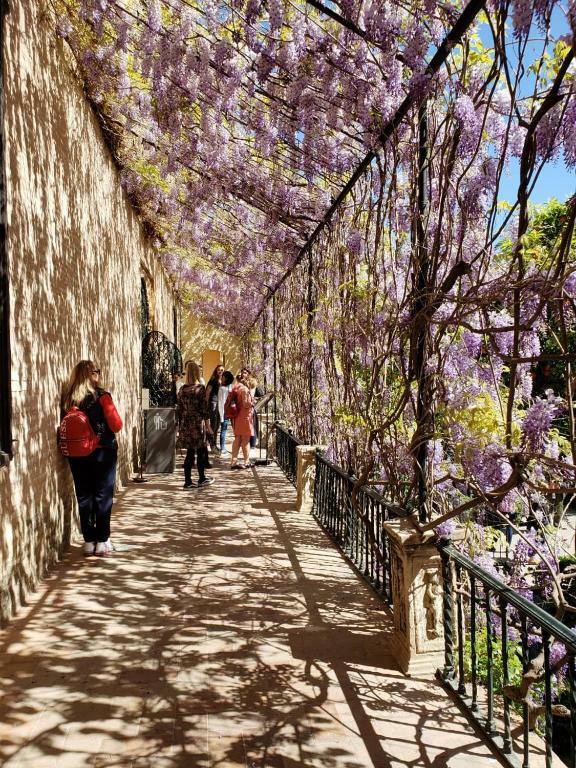 Nuestro apartamento posee todo lo que se desea cuando quieres descansar tras las emocionantes jornadas que os esperan visitando Sevilla. Buenos dormitorios, sofá, televisión, baño con bañera para vuestros pequeños, climatización y calefacción, un diseño suave y tranquilo para relajarse en pareja o familia, y la modernidad de nuestra conexión wifi para consultar cualquier información sobre vuestro viaje, y estéis conectados a las actividades y eventos a vuestro alrededor. La cocina esta completamente nueva y equipada con lo básico para lo que necesitéis, aunque no debéis perderos los bares y restaurantes que os recomendaremos a vuestra llegada. Viajar y conocer nuevas culturas es sin duda lo que mas nos gusta. Intentamos poner todo nuestro esfuerzo en conseguir los máximos recursos para poder disfrutar de esos momentos de evasión el mayor tiempo posible del año. 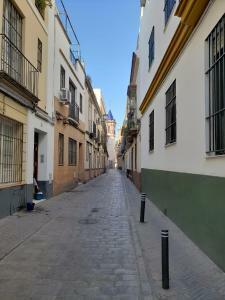 El apartamento se encuentra en una de las zonas mas antiguas y populares de Sevilla, acceso norte milenario desde extramuros. Este entorno desde calles Feria, San Luis, Pasaje Mallol, Enladrillada y hasta Calle Sol, siempre ha sido una zona típicamente artesanal, mercantil, y mas cercanamente de oficios industriales, lo que ha generado una tradición de gente emprendedora, que vende y consume preferentemente lo que se genera en este barrio, muy ligada al ámbito de las artes manuales, los oficios artesanos, la gastronomía popular, y últimamente la agricultura ecológica y urbana. Todo ello sin olvidar el enorme arraigo y sabor a cualquier rincón popular, bar o mercado, las Hermandades locales, extendidas entre todas las clases y creencias: La Hiniesta, Los Gitanos, La Macarena, La Amargura, El Carmen Doloroso, Los Javieres, La Cena, San Roque... Todas pueden ser apreciadas en sus templos o en procesión a pocos minutos del apartamento. Para ello os podemos dar orientación específica en las fechas y localización para su disfrute. 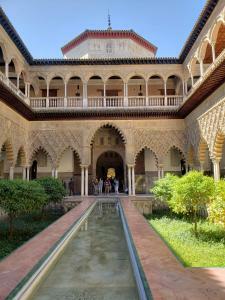 Finalmente, no olvidamos la particular imagen y arquitectura urbana de judería, con calles estrechas y frescas, típica sevillana y andaluza. 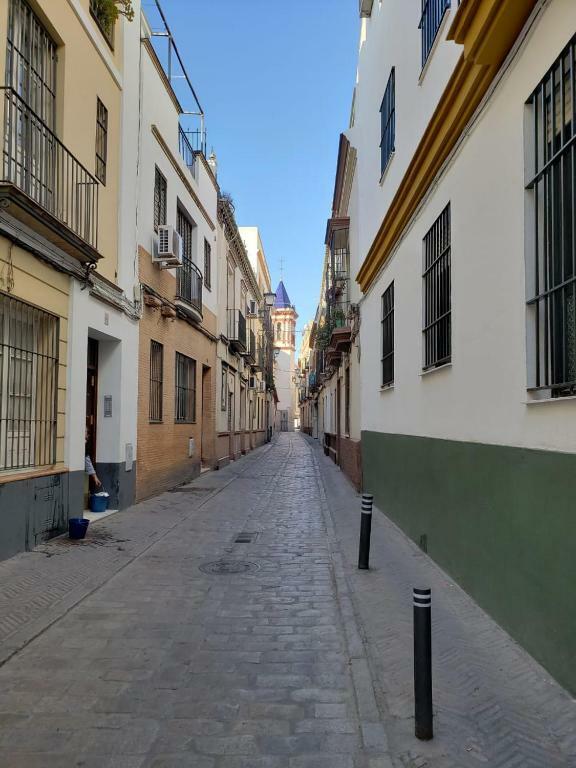 Area Info – This neighborhood is a great choice for travelers interested in architecture, atmosphere and tapas – Check location Excellent location – show map Guests loved walking around the neighborhood! House Rules Apartamento Jardin de Santa Paula takes special requests – add in the next step! Please inform Apartamento Jardin de Santa Paula of your expected arrival time in advance. You can use the Special Requests box when booking, or contact the property directly using the contact details in your confirmation. Angel is the best host we ever had throughout our Europe trip. The apartment was clean, tidy and cozy. We definitely will come back and stay in his apartment again in the future. He guided us how and where to go in the city. He even recommended to us the best restaurant and tapas in town! We had a lovely stay. Thank you for everything Angel! Very cold floors in winter. Glad we took slippers! Bathroom was cold in winter even with heating on. This apartment was great. Angel is a very friendly host who gives tons of information Seville is a wonderful city to be. And if you are a runner: go to the river in the morning and run along the river bank (in the morning there is shadow). Had to pay for parking. Nothing all was very good. Angel is very kind to prepare everything and very nice receiption for our late arrival. The apartment is very clean and warm to relax and enjoy our time overthere. Five stars to recommend! A very nice apartment close to the centre of Sevilla (at walking distance of most popular touristic attractions). Our host picked us up at the airport and drove us to the apartment. Easy and not expensive. The host is very friendly and helpful, he showed us some shops and restaurants in the neighbourhood and he even took us to a local tapas bar. We were very pleased about our stay in this apartment! The landlord Angel is kind and friendly. He contacted us a couple of times to confirm the arrival time and even our car's model. The apartment is cosy and comfort and the landlord prepared everything we needed. Most attractions are within walking distance.